We have used DT Builders, led by Darren, for several inside and outside projects on our house since we moved in 6 years ago. The work by Darren and his team has always been quick, precise, constructive and efficient. Quotations and estimates for work always accurately describe the task, seem fairly priced and are delivered quickly. Where a better way of doing a task was possible, Darren is always ready to suggest, explain and discuss its merits with you. They turn up and start work when they say they will (as you know this is not always the case with some firms). The work undertaken for us has required a number of skills, all of which Darren and team have provided expertly, efficiently and cheerfully. The work site, once completed was always left clean and tidy and any minor snags quickly rectified, with no quibbles. 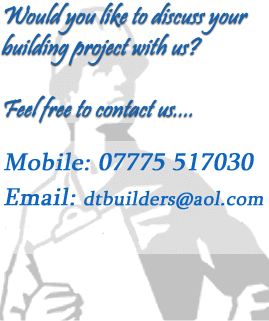 I will happily recommend DTbuilders as a reliable and efficient team for your building work.